Anything that’s in motion is constantly shifting as most market segments are forever evolving. What worked last month may no longer work today. Technology is a blessing as it can be a curse. It’s empowered individuals to work, read, shop, socialize, and find information with pinpoint precision. This technology revolution has also become a difficult pill to swallow for some of the more established traditional based industries, such as advertising, as it can be a risky crapshoot to begin with, some claim built on a house of cards. Thanks to the Internet, when we the consumer are searching for information, what we’ve come to expect is the precise information that we’re seeking to be served up for us instantly, this wherever we are or whatever device we use. We want to make our lives easier, save time and money in this consumer orientated landscape. For businesses, this means providing information that their buyers are demanding, this in the places where they frequent the most. Say hello to native advertising. Native is naked at its basic core. It’s less disruptive than any other form of traditional advertising methods before it, which at times involved forcing ads down someone’s throat. Since display advertising can be distracting, to get better more refined and desired results, what native advertising does is it integrates directly into the users experience. Native advertising is convenient because it doesn’t need or expect the users to stop or get annoyed at what they’re reading, or force them to do something that they don’t want to. For instance, you happen to be reading an inspiring story online about a boy who had a terrible accident and lost his ability to walk. Then you learn that because of the unconditional love for his dog, developed the willpower to walk again. You then begin to feel all warm and fuzzy that life is indeed good and love does exist by reading this story. Then suddenly, you get distracted by a motorcycle ad right next to the article. You get annoyed since the boy was involved in a motorcycle accident. This is the flaw with traditional conventional advertising. The ad doesn’t blend in with the theme of the article, rather the polar opposite. These ads are forced on you regardless, making you annoyed. These types of traditional ad placements doesn’t help the advertiser whatsoever, nor do they help the consumer or the publisher. This is why native advertising works, as they complement the article, working in harmony with the content. The most ideal native ad placement for that injured boy article would be an ad for adopting stray dogs, or making a donation to a pet shelter, then the click through rate on the ad would skyrocket. You’re heart has been captured by the sob story, so the advertiser and the publisher shows you a heartwarming dog related native ad. The advertiser then gets the exact exposure to the precise audience, and the consumer gets exactly what interests them. The publisher earns ad revenue and a loyal advertiser. This becomes a win-win on all three levels. The biggest challenge when it comes to making native ads work is being transparent while remaining relevant. The consumer never wants to think that they’re being duped, getting manipulated, misled, or used. Native advertising isn’t anything new however. It’s a fresh take on an established advertising model, the advertorial. Advertorials are pure advertising sites which appears like it’s a news editorial, usually in article form which looks and reads like a review or testimonial site. Whenever someone is looking to buy something, they’ll search for these review type of sites before they decide to buy. What they’ll do is search for articles to learn about a particular product or service they’re interested in. For instance, you’ve developed a brand new hands-free Bluetooth device that you’re wanting to advertise, this to readers on a parenting site. A precisely placed native ad can be the best method. To best explain and get the most exposure of the products benefits, the “advertorial” should be distinct from the other articles on the parenting site. Also make sure that the article contains valuable information for the consumer. The native ad advertorial could be an article titled “8 Things You Should Know Before Your Teen Gets A Driver’s License.” One of the points could be a hands-free Bluetooth device for their smartphone, (Your product) this so they won’t get distracted while driving. This way, what the consumer does is they’ll first learn such a product exists, while learning other new and relevant information and tips. Everyone then benefits. 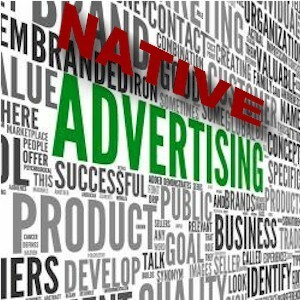 Native advertising is considered a medium that’s “brand” driven, while native e-commerce ads are publisher driven. But regardless of what native method is used, the content needs to be flawless. Complement whatever it is that the consumer is already engaged in, and then your chances of success increases. Integrating content seamlessly becomes the key. When this is done effectively, it increases user engagement which increases revenue. All of the top consumer orientated authority publishers on the Internet now employ native ads with success. Not only does it allow the publishers to maintain the integrity of their content, but they’re also creating additional revenue streams. Most online publications are finding that they can engage their readers longer with products and services which comply with their theme, while advertisers and affiliates can get the precise exposure they need. The ad industry is shape shifting rapidly, and a marriage of convenience is occurring by using native ads. The publishers and the advertisers are evolving to better serve the savvy consumers of tomorrow.